Rise Poker Team a glimpse of poker, patching futures? We were kinda just kidding when we suggested this might be the Year of Free/Subscription Poker. I mean we knew we were gonna see some moves into WSOP poker space by various free American-friendly play money sites … but how that would translate at the 2011 World Series (and beyond) wasn’t so clear. It still isn’t. But Rise, makers of those douchebag-free poker clothes and now an online poker site … is showing that they will indeed be a force in the free poker future … whatever that might mean. 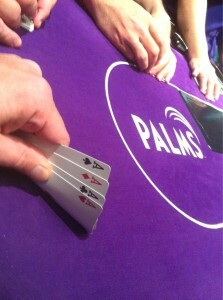 Move over Full Tilt Poker dot net. Scotty Nguyen sends the whole table a virtual Corona! Personally, I don’t think they coulda picked better pros — Scotty Nguyen, Maria Ho, Jean Robert Bellande, and Dani Stern, aka Ansky (not pictured) — even better than a Team of Brunson, Hellmuth, and Negreanu, imho. If you don’t see why these pictured three +Ansky should do incredibly well @RisePoker … well, I could tell you, but, well … let’s say it goes beyond just “Asian”. Russ “Dutch” Boyd wins his second career WSOP bracelet, defeating Brian Meinders heads-up to win the $2,500 Limit Holdem 6-max event, collecting $234,065. Meinders earns $144,650 for the runner-up finish. A full list of results and Nolan Dalla’s tournament report is online at wsop.com. Day three of the $10,000 Omaha Hi/Lo 8 or Better World Championship will resume at 3pm with Michael Chow, winner of a Omaha 8 bracelet earlier in the WSOP, leading with 600,000 in chips with 23 players remaining. Among the returning players: Sammy Farha (512,000), Eugene Katchalov (463,000 after being down to a single 1,000 chip), Jean-Robert Bellande (314,000), David “Bakes” Baker (283,000) and “Miami John” Cernuto (269,000). The full list of chip counts is online at PokerNews. Day 1b of the $1,000 No-Limit Holdem tournament concluded with 222 players returning this afternoon at 2:30pm to join the 290 day 1a survivors, with 342 players making the money. The reported chip leader from last night is David Wilkerson with 66,400. Other notables: Eric Froehlich (47,325), Tom Dwan (36,250) and Chad Batista (34,000). A full list of chip counts is at PokerNews. It’s another doubleheader today, with the 12pm tournament the $2,500 No-Limit Holdem 6-max event, last year won by Brock Parker in a field of 1,068 for $552,745. The 5pm tournament is the $1,500 Seven Card Stud Hi/Lo 8 or Better event, won last year by David Halpern for $159,048 in a field of 466. The first $1,000 No-Limit Holdem bracelet of this year’s WSOP was awarded to Canadian Aadam Daya defeating Deepak Bhatti in heads-up play. 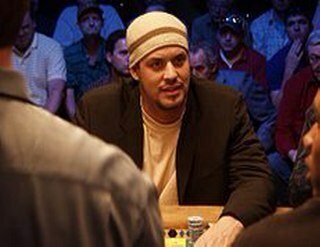 Daya won the sixth-largest live poker tournament in history, besting a field of 4,345 players to earn $625,872. Bhatti picked up $385,106 for the runner-up finish. The full list of results and Nolan Dalla’s tournament report is available at WSOP.com. Praz Bansi picked up his 2nd career WSOP bracelet, winning the $1,500 No-Limit Holdem bracelet, defeating Vincent Jacques heads-up to prevent a Canadian sweep of bracelets on Wednesday. Jacques earned $320,913 for falling just short of a bracelet, the full list of results and Dalla’s report are online here. Josh Schlein leads the remaining 270 players returning at 2:30pm for day 2 of the $1,500 No-Limit Holdem with 127,300 in chips. Other notables on the leaderboard: Jean-Robert Bellande (89,200), Phil Hellmuth (84,700), and Amnon Filippi (55,800). 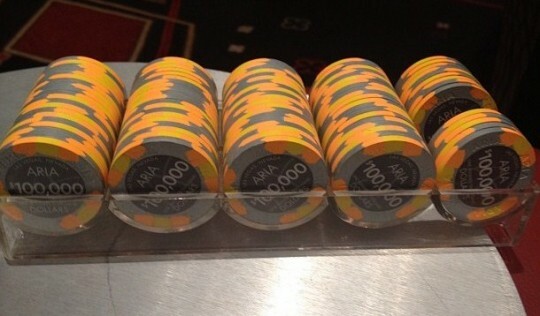 The full list of chip counts can be found at PokerNews. The $1,500 Pot-Limit Holdem event starts at 12pm today, won last year by John Paul Kelly for over $190,000 in besting a field of 633. A compact field is expected at 5pm today for the $10,000 Seven-Card Stud World Championship won by Freddie Ellis last year, winning over $370,000 as the last man standing in a field of 142. Four remain at the $1,000 No-limit Holdem final table, with Gabe Costner (4,300,000) holding the chip lead over Deepak Bhatti (3,400,000), Aadam Daya (2,200,000) and Bart Davis (1,800,000) . Nicholas Mitchell ($154,425), Cory Brown ($116,141), Isaac Settle ($88,025), Dash Dudley ($67,221) and Richard Rice ($51,375) were the first five to exit the final table to collect their winnings. Eight players are currently seated at the final table of the first $1,500 No-limit Holdem of the WSOP, playing down to a winner tonight. David Tuthill will be the chip leader (2,000,000) when the remaining eight players return from dinner break. Tomer Verda is close behind with 1,822,000 while David Sands (636,000) and Praz Bansi (600,000) towards the back of the pack. Dwyte Pilgrim picked up his first career WSOP cash, finishing 21st for $15,222. Others who fell short of the final table include Yuval Bronshtein (12th for $29,795) and John Myung (17th for $18,809). The $5,000 No-Limit Holdem Shootout so far has seen Brent Hanks and Neil Channing the first two winners moving on to Thursday’s final table. Blair Hinkle, John Duthie, Chino Rheem, and Heather Sue Mercer are among the remaining 14 players trying to earn one of the final four seats. The $2,500 2-7 Triple Draw Lowball field is down to 37, with just 30 making the money this evening. The current chip leader (151,000) is Jordan Siegel, recognizable by most people as the MC for the NBC Heads-Up event at Caesars’ Palace in Las Vegas. Other notables looking to cash: Ted Forrest, Allen Kessler, Greg Mueller, Tony G and Rob Hollink. For Team Pokerati watchers, Pat Poels is hanging in there with 63,000, while Tom Schneider was knocked out in early action. The second $1,500 No-Limit Holdem event drew a field of 2,341 entrants, with less than 800 returning after their 90-minute dinner break to play the final four levels of day 1 tonight. The 243 finishers get paid, and some of the names to watch for when play resumes: Mark Seif, Jean-Robert Bellande, Shaun Deeb, Barry Shulman and Lee Watkinson. But just a couple months ago I was watching Jean-Robert Bellande seemingly tear it up in the high-stakes room at the Commerce, sitting with easily 40 or 50k in front of him. But now, by his own admission on twitter, @BrokeLivingJRB is busto. Super-busto it seems. Terrible timing as we approach the WSOP. Be sure to check out his twitter feed. Bio Poker Pro. 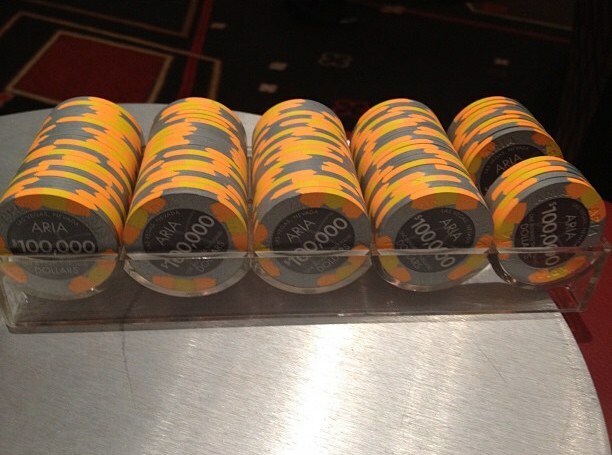 Track my crazy swings as I take my bankroll from zero to a million. Hmm, didn’t quite work out that way — or at least hasn’t yet. It’s so hard not to root for this guy. He knows himself, and just can’t control himself (?) … but still insists on being a “survivor” … and is willing to share his glorious collapse with all. Reading his tweets in reverse chronological order provides quite the revealing story about a poker unraveling … something all of us who aren’t consistent winners and don’t have real regular jobs may or may not wanna think about. A semi-ironic old photo (l to r) of Phil Hellmuth, Clonie Gowen, and David Williams. And indeed, David Williams is no longer a Bodog pro. What, winning the WPT World Championship and wet-cementing himself as truly one of the top-top players in the game isn’t quite the “Bodog Life”? Maybe his minglings with hot chicks and celebs at Vegas nightclubs doesn’t count as much if he ain’t drinking hard? Williams (go Dallas poker! ), of course, was one of the longest-lasting Bodog pros. 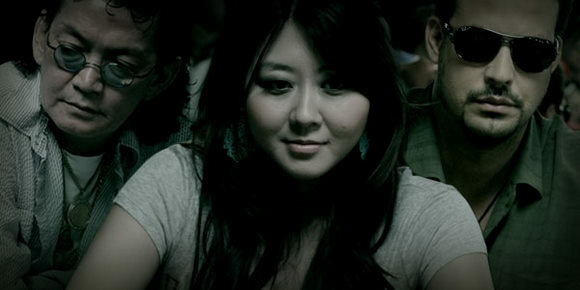 The site recently scrapped Jean-Robert Bellande and Justin Bonomo, but they kept Evelyn Ng. Who woulda thunk that second place in a 2004 six-player ladies sit-n-go could ever mean so much! Oh, and the big news somehow related to it all … Bodog did sign Amanda Musumeci, a hottie-ish 25-year-old American who built her microstakes bankroll into nearly $200k online. (Click for her Betty Page-meets-online-grinder pics.) She goes by the name “Manderbutt“, btw. Kinda looks like a Manderbutt, no? I’m pretty sure we’ll discuss this a little more on the next Poker Beat … but you gotta think whatever was behind this move — again, more crazy industry shifting — it makes @dwpoker one of he hottest commodities in the game. Unless of course he decides to vigorously declare his online poker independence and run all Darvin Moon with his newfound free agency. It takes a special white man to be able to make slavery jokes … but hey, that’s the kind of breaking down of barriers that becomes possible when you gamble for reparations.